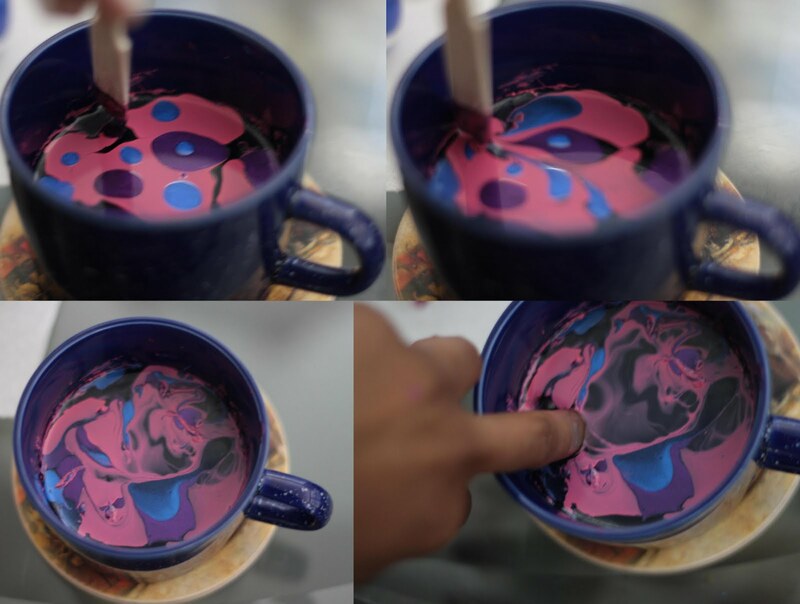 Perusing Refinery 29 the other day and I stumbled upon this marble nail DIY. So, I decided to try it out myself and give you lovely muses a tutorial in the process. (I haven't done a nails of the day since I learned how to use crackle polish). 5. 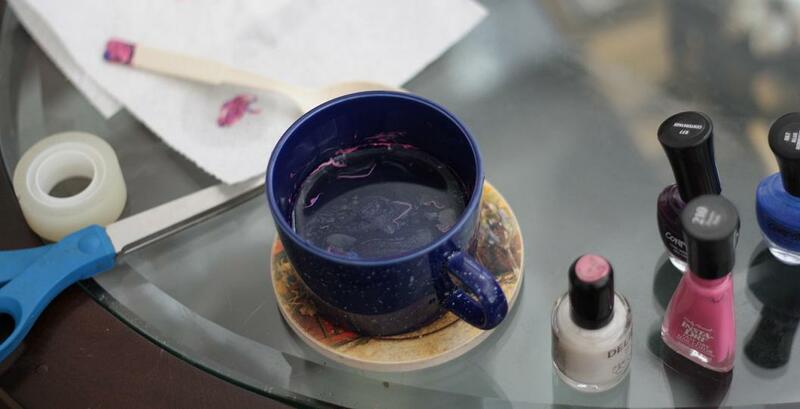 Use your plastic utensil (I had a spoon) and place the tip of it just on the surface of the polishes in the water. Use it to separate the colors and make a design. 7. Use the utensil to scoop up the rest of the polish around your nail in the water--it'll come right up. 8. Take your finger out and remove the tape. If you taped correctly (which takes some getting used to) you should only have polish on your actual nail instead of all over your finger. *I don't think my water was exactly room temperature because it didn't separate as nicely as I wanted it to. Also, I found the Sally Hansen (the pink) polish to work a lot better than the two Confetti polishes. **Since my polishes weren't separating how I wanted them to, I ended up placing my fingers into the least concentrated area instead, which gave me a more defined look. 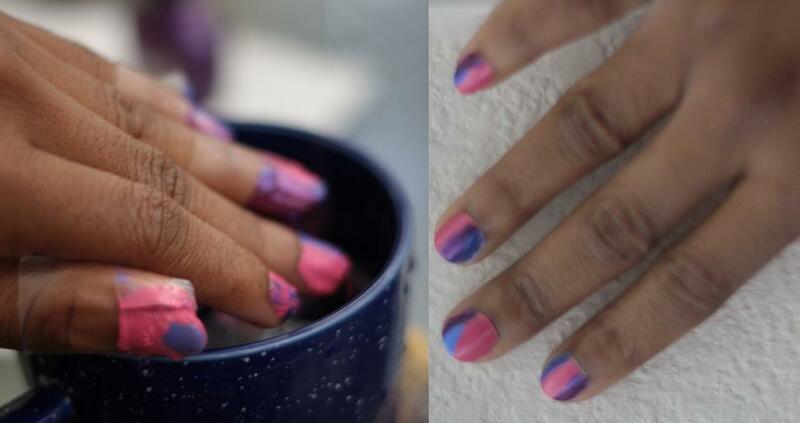 I hope you muses were able to follow this tutorial well enough to recreate your own marble nails. this is so interesting!! love it!! WOW! hehe I would have NEVER EVER thought of doing that! Pretty awesome! I've seen this everywhere! I really want to try it one day! I wonder if glitter nail polish will work with this too?! that is so rad!!!!! but i am far too lazy to follow all of those steps. it's pathetic, i know! haha. it looks awesome though!!! What a fun idea and a great tutorial with photos! Your nails turned out great...love the mixture of colors. My stepdaughers would love to do this! :) I hope you had a great weekend love. Ohhhh! I absolutely love this! I'm going to try this! omg how clever, i will definitely try this! My coworker just told me about this!! I love the way it looks, but I am not sure I would have the patience. I might try it some time when I have time to spare. :) I'm so glad that you did this tutorial for us! Oh wow, this is great!!! I'm not one who usually applies nail polish on my nails but just on my toes. Love the colors. MAD COOL! Now, all I have to do is stop biting my nails and release the aryclic. . .*looks nervous* aha. Ohhh. I'm so gonna give those a try! Thank you so much for this awesome post! Been looking for something new and cool to do with my nails that's DIY. I believe I've exhausted the Blasted Nail Look. What a great idea and it doesn’t seem so hard, I have to tray this one, also nice color combination, I love the result! Your have a lovely blog and I'm a new follower! Hope you'll like my blog and follow back! This is so cool! I might have to try this on a rainy day. Great tutorial, Cheryl! I love this look, but have yet to try it myself. Perhaps this will be my weekend project! :) Thanks for the tips! Haven't seen anything quite like this. Love it. Great tutorial! COOOL! You did so well! I wish I could do my own nails. I am terrible at it. AWESOME!! I must try this, they look so cool!! Cheryl I love the colors-great DIY and I am totally going to feature it in the qeeky roundup! oh my goodness!!! i love it!!!! im really going to do this one soon thanks for sharing girl. That is pure genius!!!!!!!!!!!!!! LOVE!!!!!! Love this! Can't wait to try it out if I can figure it out maybe I'll post about it and repost it on my blog and give you credit!